CHIBA - Shoichi Ino gave up a quite a few hits and he allowed a number of base runners in his start against the Chiba Lotte Marines. Ino made sure that runs, however, remained in short supply. 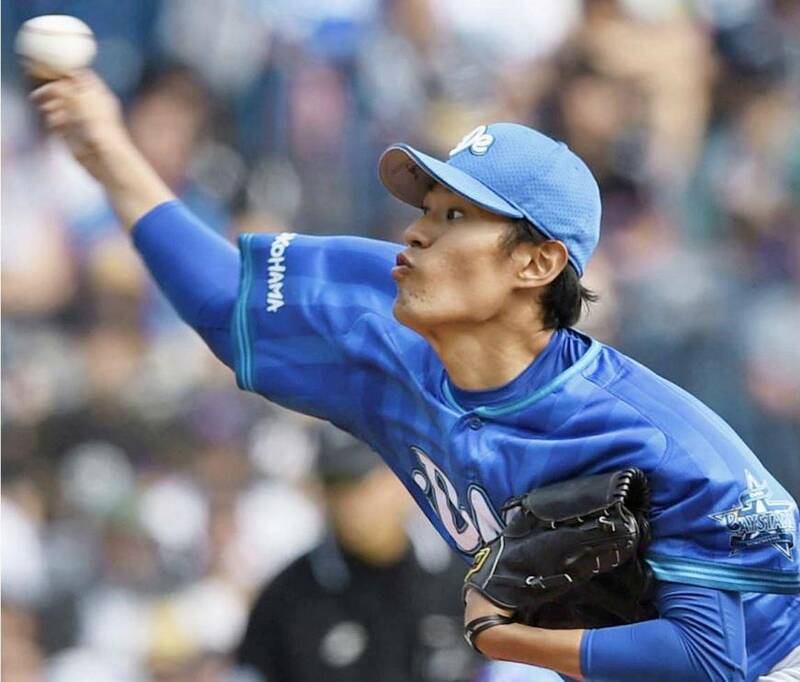 Ino pitched his way out of a few sticky situations, before the BayStars broke the game open in the ninth en route to a 5-1 win over Lotte on Saturday at QVC Marine Field. “He got into a couple of tight spots, but was able to keep holding them back,” said BayStars manager Kiyoshi Nakahata. Ino (4-2) was locked in a pitcher’s duel with Lotte starter Ayumu Ishikawa (4-3) for most of the afternoon, never pitching with more than a one-run advantage. Ino allowed only an unearned run over eight innings, striking out one and walking three. He threw 121 pitches, his third straight outing with at least 120. The BayStars pulled ahead in the top of the seventh on a tiebreaking pinch-hit RBI single by Tatsuya Shimozono, and Ino had to work hard to keep his club out front in the bottom half. “Ishikawa was pitching pretty well, so I wanted to make sure I was able to protect the lead,” Ino said. Imae, who entered the game 3-for-7 in bases-loaded situations. Ino jumped ahead 2-0, but evened the count with a pair of balls. He got a harmless fly ball to second with his fifth pitch to end the threat. “I’d been throwing inside well and with the count 2-2, I wanted to try to make a good pitch inside against him,” Ino said. The win was the latest in a string of good outings for the BayStars righty. Ino won for the second straight start, and has given up three runs — two earned — in his last three combined, a span of 25 innings. “I want to keep it going,” he said. Shuto Takajo finished 1-for-4 with an RBI single for Yokohama. Masayuki Kuwahara had an RBI triple in the ninth, and Takehiro Ishikawa was 2-for-5 with an RBI. Lotte’s Ishikawa allowed a pair of runs on 10 hits in the loss. He struck out three over eight innings. Marines reliever Naoya Masuda had a disastrous ninth, giving up three runs on three hits. The loss snapped Ishikawa’s streak of nine consecutive winning decisions at QVC Marine Field, dating back to last season. His last defeat there came on May 11, 2014, against the Tohoku Rakuten Golden Eagles. The BayStars managed to hold Kiyota in check, with the outfielder finishing 1-for-5 at the plate. Kiyota is hitting .369 for the season and has a 16-game hitting streak going. Takashi Ogino drove in a run with a double on a 2-for-4 afternoon, and Shunichi Nemoto had a pair of base knocks. 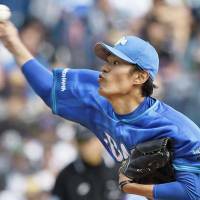 SAPPORO — Shohei Otani struck out 13 batters for the Pacific League’s Hokkaido Nippon Ham Fighters in a 4-2 interleague win over the Central League’s Chunichi Dragons on Saturday. Before 21,350 at Sapporo Dome, Otani (7-0) allowed just three hits and three walks, but two of the walks proved costly. He surrendered single runs in the second and third after walking the leadoff man each time. But he finished by retiring the last 17 batters he faced with his good heat and sharp action on both his curveball and forkball. The right-hander walked Hector Luna to open the second inning and Kazuhiro Wada hit a 1-2 slider away and lofted it into right-center for an opposite field RBI double. Otani, however, rebounded, with three straight swinging strikeouts to keep Wada from scoring. With the bases loaded and one out in the third, Luna singled off a high 1-1 fastball to make it a 2-0 game, but Otani got out of the inning after striking out Wada swinging at a forkball for the second out. Trailing by a run in the sixth, rookie Daiki Asama and Ono delivered RBI doubles off Dragons reliever Shinji Tajima (3-3) to give Otani the lead for the first time in the game. “After our first-year guy Asama kept it alive, I went into the batter’s box trying to bring him home, because Shohei was doing such a great job for us,” Ono said. The game started out as a duel between aces, but didn’t remain so for long. The Fighters loaded the bases in the bottom of the third against Dragons starter Kazuki Yoshimi. The right-hander, who has impressed this season in his return from Tommy John surgery, ended the inning by striking out cleanup hitter Sho Nakata, but did not return to pitch the fourth. Nakata slugged his 18th home run in the seventh to provide some extra insurance for the hosts. At Osaka’s Kyocera Dome, Hiroshima’s Kosuke Tanaka scored the go-ahead run in the ninth after a leadoff double, a sacrifice and a Yoshihisa Hirano (0-1) wild pitch. Francisco Caraballo’s game-tying solo homer in the eighth ended up in vain as Orix fell 14 games under .500. At Tokorozawa’s Seibu Prince Dome, Takeya Nakamura hit a two-run homer in the third before his grand slam in the fourth put the game to bed. Yusei Kikuchi (1-2) struck out 11, while allowing two runs in seven innings as Seibu snapped Hanshin’s four-game winning streak. At Sendai’s Kobo Stadium, Itaru Hashimoto doubled in the go-ahead run in the 11th inning and scored another on a throwing error as Yomiuri beat Tohoku Rakuten in 4 hours, 23 minutes. At Fukuoka’s Yafuoku Dome, Kazuhiro Hatakeyama broke open the game with his 11th home run, a three-run, sixth-inning shot and Masanori Ishikawa (4-5) allowed a run in 5-1/3 innings to get the win as Tokyo Yakult knocked Fukuoka Softbank out of first place in the PL.